Ballpark Basics: What could have been a great night, turned into a minor nightmare. Ballpark Breakdown: Arriving at Lindquist Field on a steamy night in the middle of a July heat wave, we headed to the box office and were excited to discover they were giving away free general admission seats for that night’s game. 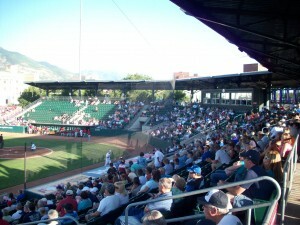 At Lindquist, general admission consists of two sections down the left field line or bleachers just past the first base dugout. Since the bleachers were awash in the brutal Utah sun that doesn’t set until after 9 pm during the summer, the two sections down the left field were the popular spot of the night. And considering the average family in Utah has 5.4 kids it was packed with kids constantly getting up and running up and down the aisles. The team name is short for the dinosaur the velociraptor due to the amount of fossils found Northern Utah. They have incorporated dinosaur imagery with the team and throughout the stadium. 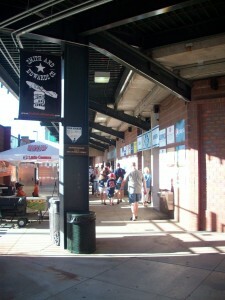 The main entrance is right behind home plate and it leads into a narrow concourse wraps around underneath the grandstand. The narrow concourse is made worse by the pillars holding up the grandstand. You are either dodging one of them or one of the millions of kids that are running around unsupervised (Seriously, they have a lot of kids out there!). With the concourse being under the stadium you can’t watch the game as you walk around. There is an upper concourse that you can walk around if you have a ticket for the assigned sections, but the ushers were extremely rude and wouldn’t even allow you to walk the upper concourse behind the seats. We thought at first it might be something to chalk up to free general admission seat night, however, after reading reviews on other websites it appears that this is not an isolated issue and the Raptor ushers are not the most pleasant in the minor league. It’s like they don’t realize this is Single A ball and you are not trying to upgrade to the mezzanine section of Yankee Stadium. Ushers aside, the ballpark has received many accolades over the years, mainly for its incredible backdrop. Baseballparks.com named Lindquist Field the Best View in all of baseball., and Digitalballparks.com gave Lindquist Field the same award, as well as naming it the 2007 Ballpark of the Year. The Wasatch Mountain Range stretches behind the field and gives a one of a kind view. The Ogden temple is also visible behind the center field wall leaving no doubt what state you are in. Interestingly enough, (and almost out of place) there is an abandoned warehouse directly behind the right field wall, which would probably be an excellent spot to grab a couple old home run balls – if you can break in, and don’t mind dodging bird poo. 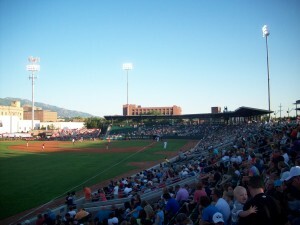 The Raptors have led the Pioneer League in attendance every year since Lindquist Field opened in 1997, which led to an expansion of the seating bowl before the 2008 season. Before the expansion, the seating bowl went just past the infield, and remains this way on the first base side, while the seating now extends all the way down the left field line. The Raptors kept the aforementioned bleacher seating down the right field line, and a small grassy knoll provides additional seating for those families who want to lay out blankets picnic style to watch the game. We are not anti-kid by any means – one of us even teaches as a day job – but the amount of really, really, young, barely supervised children, given free reign that night actually made it hard to enjoy the game. There were lost children looking for parents, kids crying, even ones just running without looking and slamming into you…which takes us to what is possibly the best part of the ’08 expansion; the addition of a deck on top of the left field wall. This turned out to be one of the best spots to actually watch the game from. 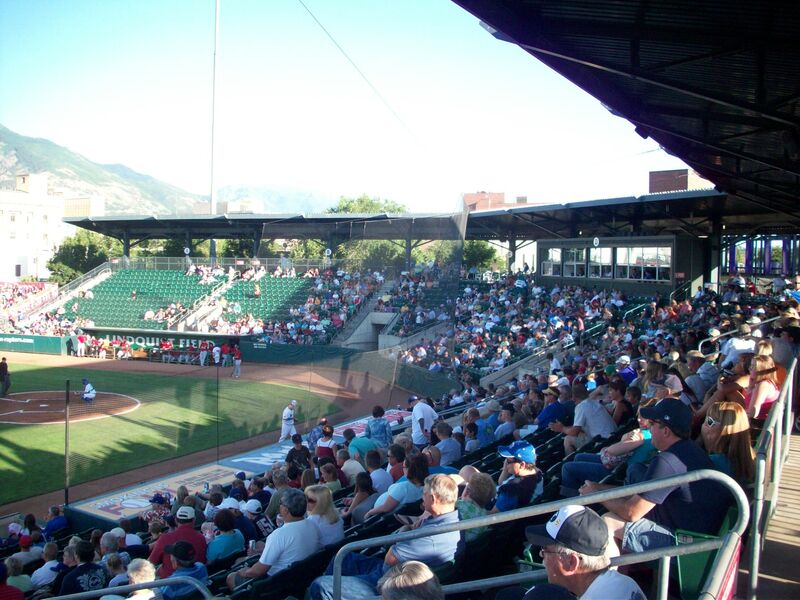 Ogden represented our first ballpark experience in Utah and knowing some of the hoops alcohol drinkers (and suppliers) have to jump through in this part of the U.S. we were unsure of what to expect as far as the beverages were concerned. Having just left Rooster’s Brewery (see below) where we were further educated on some of the random Utah liquor laws, and knowing the next night’s stop – The Orem Owlz – don’t allow alcohol in the park, didn’t encourage us. We were relieved to see that Ogden does support our love of both Ballparks and Brews as that had Budweiser products for sale at concessions and even more surprising, a cart with Rooster’s brews on tap. 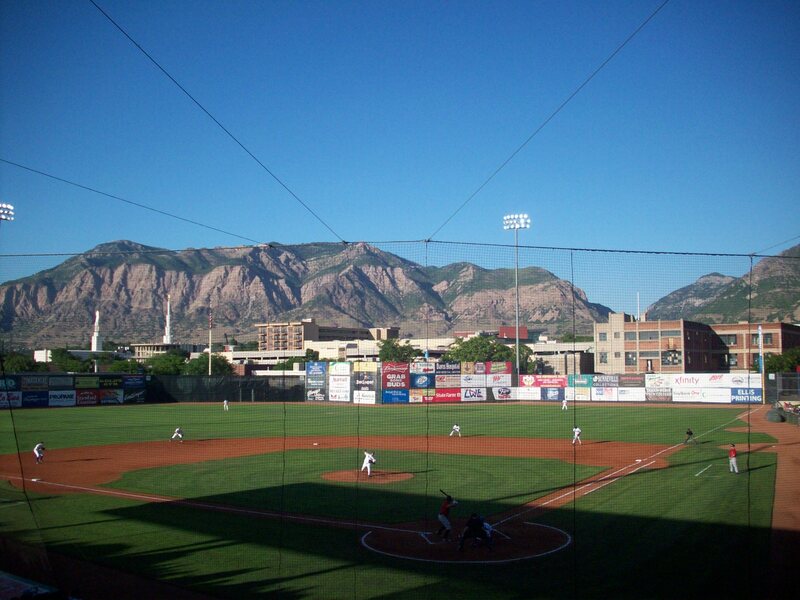 Movie Nerd Fact #1 – The mountains that form the backdrop to Lindquist Field are the Ben Lomond Peak, a part of the Wasatch Range. Rumor has it that this is the same mountain range used for the logo of Paramount Pictures. Brew Basics: Our first brewery visited based on the recommendation of a reader. Thanks @megminard for a worthwhile suggestion! 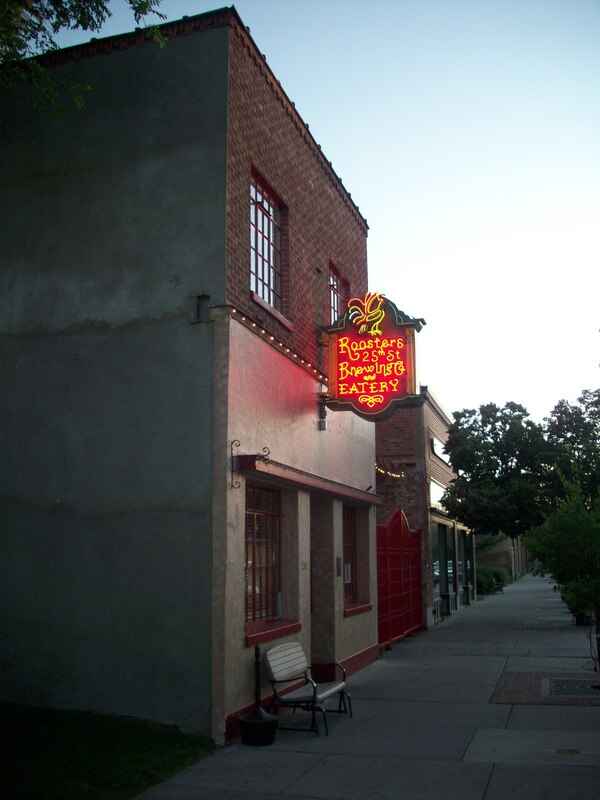 Ballpark Breakdown: Rooster’s front door opens to a narrow brick two story room with stairs to an upstairs bar, seating area and restrooms immediately to your left. Walking in, you wait at a host stand thoroughly stocked with merchandise and if you choose to stay downstairs. There are two large seating areas, one for outside seating and the other a room mainly enclosed in glass, which combined with the large doors leading to the dining porch serve to keep the temperature at the same or even a few degrees warmer than outdoors. 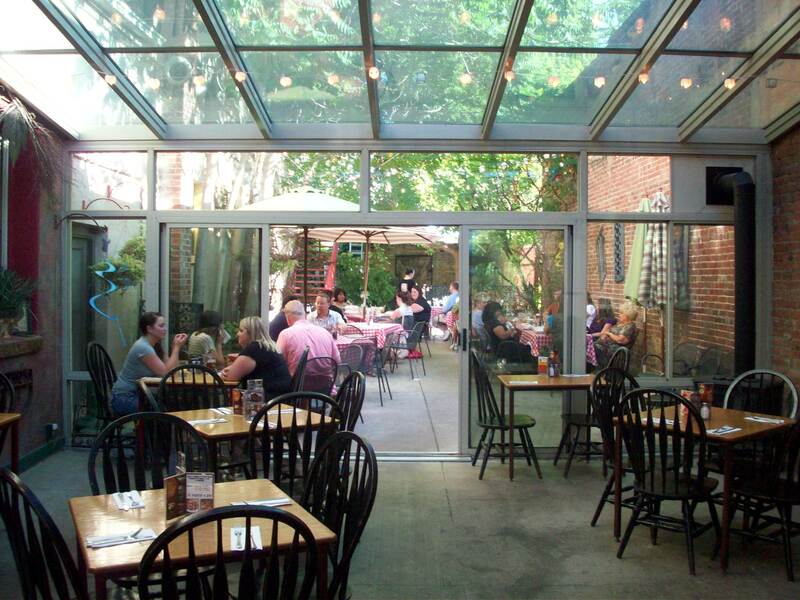 Seeing as we stopped there during one of the worst heat waves in decades – the porch where we were originally seated didn’t end up being an ideal location. We relocated to the downstairs bar, which was also not ideal. The long hallway- like set up of the main room at Roosters means the bar area is very narrow , and the wait staff is almost up in your face without meaning to be. Due to those weird Utah bar laws, alcohol cannot be stored on the bar, so the taps are out of the way and the bar area is used to store mugs for the mug club. Unfortunately, the bar ceiling is also very low, which combined with the hanging mugs give a very cramped feeling. Since you can’t read the taps, and they don’t have a beer list, you are expected to read the options off of the boards placed behind you. But the bar stools don’t swivel and there is no good place to rest your feet. The backdrop behind the bar is a window into the brewing area itself, with what looked like 1 brew kettle, 1 mash tun and 4 bright tanks visible from our seats. When we had walked in, we noticed the stairwell to upstairs but assumed it was to a private party area etc. It wasn’t until after we’d paid the tab, and were wandering around taking photos that we made our way upstairs and discovered the best seating in the house, and a larger, less cramped second bar area. Available for dining, and apparently large parties this spacious and well decorated area is definitely where we will start if we ever find ourselves back at Rooster’s Ogden. The mug club is exceedingly popular, so all your 40.00 sign-up fee does initally is get you on the year long waiting list. Once your name comes up however, you get half price appetizers, a shirt, a $15.00 gift certificate, 20% off all swag and of course, you can fill your mug for the price of a pint. But membership is not lifetime, it’s a yearly renewal, which means you need to visit often to make this a deal worth claiming. One other note, ABV’s and IBU’s are hard to come across in Utah. All the beers below were listed at 4.0 ABV, which is actually very possible since Utah law dictates that draught beer must have an ABV of 4% or lower. And now, onto the beers…. Patio Night’s Pilsner – Crisp, light refreshing and really well named as it is good for a little patio drinking. Little head, moderate carbonation and urine yellow color (We know, not the most appetizing descriptor, but in this case, really apt). This is a refreshing and very light beer that was a good way to combat the summer heat. Single Track – A pretty copper colored, highly carbonated beer. It gives off a light, earthy smell, isn’t terribly hoppy and has a malted barley aftertaste. Nothing overwhelmingly special about this one, but nothing wrong with it either. Just a good, basic ale. Bees Knees Honey Wheat – This is supposedly an unfiltered beer, but it looked clear to us. Medium body and carbonation that was like a typical ale, but just a teensy bit sweeter in the sip with the honey coming through clearly in the end. Kind of a tribute to the bee theme Utah has going on, and a nice little twist. Polygamy Pale Ale – Not the famous Polygamy Porter from Wasatch Brewing but named in the same vein. Utah loves to capitalize on those busy Mormon worker bees. (Case in point: the female staff here at Roosters seemed to have their choice of two shirts, “First Wife” or “Sister Wife”) . The beer itself is a light copper color and has a somewhat unusual aroma that smells like sugar and hops. The taste is slightly bitter, with distinct but not prominent hops, and a slight floral burst. Two-Bit Amber – Hazier than the others and dark orange peel in color. This beer started out slightly bready, flat and sour with just a hint of orange and wheat. While it grew on us as we drank, it seemed to be our least favorite of the day. Junction City Chocolate Stout – This one just smells like awesome. A combination of mocha and roasted malts that is lighter than most stouts – almost more like a porter. Made of six different malts (hence the “junction”) and a bit of smoked wood on the palate. The thickest and most complex flavor wise of the beers on tap at Rooster that night, and worth getting again. 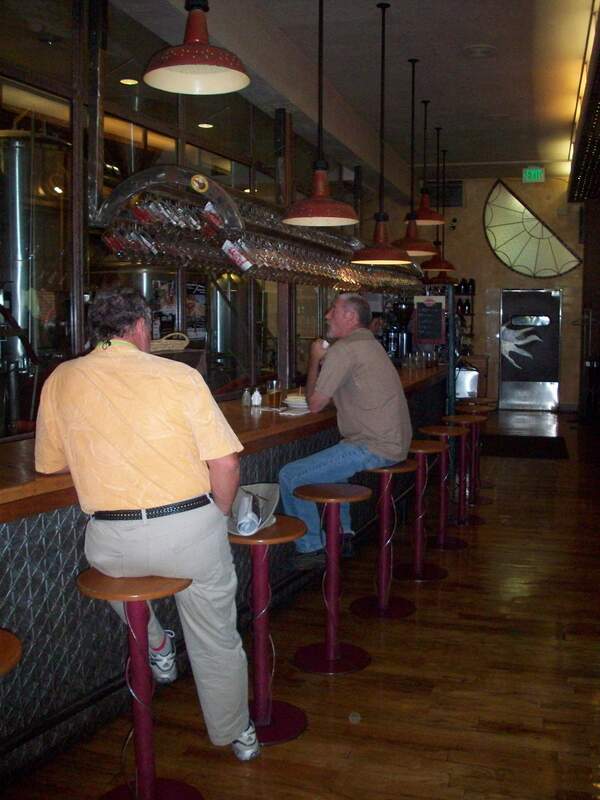 Thanks to those weird Utah drinking regulations, in many restaurants the only place you can’t drink wine or liquor is at the bar. Anywhere else in the restaurant is fine- just no drinking at the bar. It has to do with separate licenses that even the bartenders found a bit too convoluted to explain. Good thing we stick to beer!